Erin Telford shares how breathwork can empower us to connect with our intuition, channel our inner strength, and recognize our own ability to heal. Erin Telford is a certified Breathwork teacher and healer, acupuncturist, Reiki Master, and herbalist. Learn from her at our all-new 2-day Festivals in San Francisco and Seattle! For tickets and more information about Wanderlust San Francisco, click here. For Wanderlust Seattle, click here. Fear. Anxiety. Anger. Rejection. Inadequacy. If you’re an adult human in modern society, chances are you’ve experienced at least one of these emotions or thoughts, and they’ve likely appeared more than once. For many of us, it’s these negative emotions that prevent us from leading a purposeful, vibrant life—trapping us within patterns that do not serve us. What if we had the power to change our storyline? 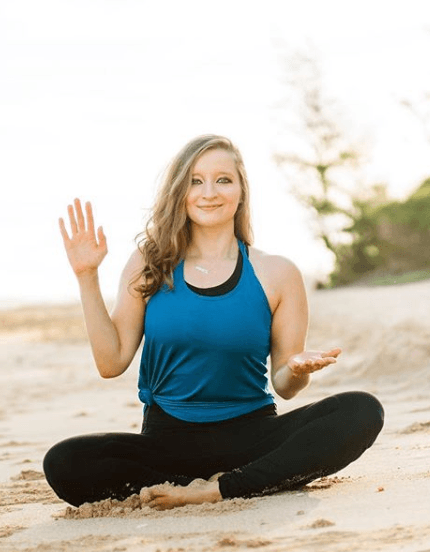 Breathwork teacher and healer Erin Telford facilitates powerful breathwork experiences around the world, holding space for people to release negative emotions, trauma, and limiting beliefs—and connect with their intuition for profound healing. Erin began her healing as an acupuncturist, herbalist and Reiki master, but it wasn’t until she experienced David Elliott’s style of breathwork at a yoga retreat in Nicaragua that she found the catalyst for her own personal healing. It was like I was altering the interior of my nervous system, my heart and my spirit, and my sacred inner space. I had the opportunity to participate in Erin’s Full Moon + Spring Equinox Breathwork Circle on March 20, and I, too, was amazed by the power of such a simple breath technique. Consisting of a pattern of two inhales and one exhale—all through the mouth—this style of breathwork is quite active and requires a significant level of effort to practice for the allotted amount of time. During Erin’s breathwork circle, I felt intense sensations throughout my nervous system, as my body temperature dropped and I seemed to lose control of what my body was doing—except for my continued “inhale, inhale, exhale” pattern of breath. As Erin explained after the session, the kind of physical experience I felt during her breathwork circle is the physical manifestation of fear leaving the nervous system. “We think of trauma as living in the mind because we think about it. We’re spending most of our time in our heads, but trauma actually lives in the nervous system,” Erin says. She explains that while not all of us have experienced extreme physical, sexual, or emotional trauma, we are all subject to the daily emotional traumas that accompany life in the modern world, like not feeling loved, accepted, or understood. We think of trauma as living in the mind because we think about it. We’re spending most of our time in our heads, but trauma actually lives in the nervous system. Erin emphasizes that the separation between the physical body and emotional body has extensive impacts, manifesting through a wide array of symptoms and dysfunction. “Every manifestation of troubles that we have as adult people is created through disconnection from our emotions, emotional suppression, and not feeling at home or safe in our bodies,” says Erin. Breathe into your inner strength with Erin at Wanderlust San Francisco on May 4–5 or Wanderlust Seattle on May 18–19. For more events with Erin, check out her Breathwork + Sound event at Grace Cathedral San Francisco on May 3 and her Radiant Heart Breathwork event at Sangha Yoga Seattle on May 17. Laura Hanson is a writer, mentor, and yoga teacher with a background in the therapeutic applications of yoga. She focuses on using breathwork, meditation, and reflection to empower others to find their inner strength. Her mission is to enable practical wellness and help others create more productive, fulfilled lives by nurturing the mind, body, and spirit through mindful living. Follow her on Instagram and Facebook, @laurajhanson.